There is a group of Persistent Organic Pollutants (POPs) that it is critical to address to ensure we are moving towards a clean circular economy. 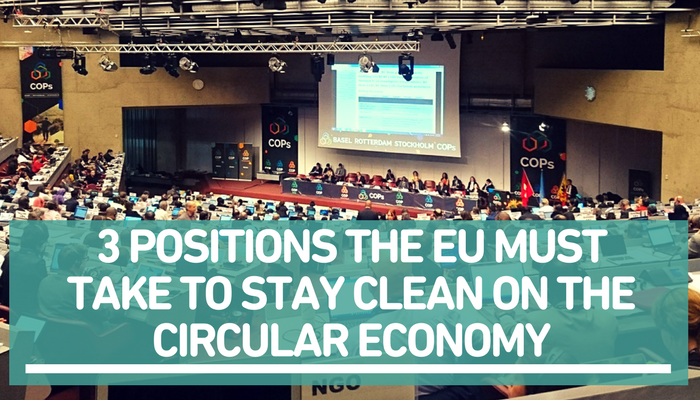 Although the EU is continuously setting the tone towards more circularity internally, it has clearly lacked ambition and clarity on the issues at stakes in Geneva this week. This post goes through the details of the negotiations around the global regulation framework of the Polybrominated Diphenyl Ethers (PBDEs) and outlines the positions the EU must take to safeguard a clean future for the circular economy. On Tuesday, the listing of decaBDE in Annex A of the Stockholm Convention for an immediate ban was discussed. DecaBDE is a toxic flame retardant which is primarily found in the plastics of electronic devices and in some textiles and upholstery. Most countries supported this ban, but several delegations are asking for exemptions to allow for the continued production and use of this toxic POP in certain sectors. The EU in particular is asking for exemptions in the automotive and aviation sectors, despite leading companies in these sectors having already stated that a complete ban would be feasible in a very short time frame (see our latest policy briefing). On Wednesday, the debate turned to the recycling exemptions for pentaBDE and octaBDE which were adopted at a previous COP until 2030. Pakistan, Gabon and Norway in particular held very strong position to end the recycling exemption immediately, to protect the life and health of millions of kids in the global south contaminated by toys and other products made of recycled plastics containing these substances. Canada strongly opposed the immediate termination of the recycling exemptions. EU did not take a clear stand to support Pakistan, Gabon and Norway’s proposal, which is an endorsement by abstention of Canada’s proposal and an incompatible positioning in the context of the clean circular economy that EU is advocating for within its frontiers. Last but not least, an intense debate is currently taking place about the Low POP Content level (The concentration threshold above which wastes are considered POPs waste) of waste containing PBDEs allowed to be exported under the Basel Convention. In the debate, EU’s is defending a weak limit for POPs in waste which can result in toxic waste being exported outside its borders without effective controls, this represents a clear double standard and an irresponsible position. The intervention argued that such a ban was essential to prevent the recycling of waste which contains toxic chemicals at the ‘expense of the health of children or recycling workers in the informal sector or other end users of such products globally’. Recently released reports such as IPEN’s Toxic Toys have shown that the recycling of products containing toxic chemicals such as octaBDE and decaBDE has resulted in toys made from recycled plastics which contain extremely high levels of these toxic POPs. Delphine went on to say “To achieve a circular economy, we need to close the loop of materials by building trust in a toxic-free secondary material market so that both producers and consumers are willing to use them.” Increasing recycling in Europe is critical to reduce the use of virgin resources, but this aim cannot supercede the rights of children, recycling workers and other end users to a safe and healthy environment. In addition, authorising the inclusion of these banned toxic substances in recycled products seriously threatens the credibility and economic model of the entire recycling industry. Zero Waste Europe calls on the EU to support international policies which are consistent with a clean and safe circular economy today, and take a clear stand on banning POPs at the source and against recycling exemptions of POPs containing materials.